Are you looking for a Leave Application Form to provide to your employees or simply if you want to submit one yourself to take a leave? 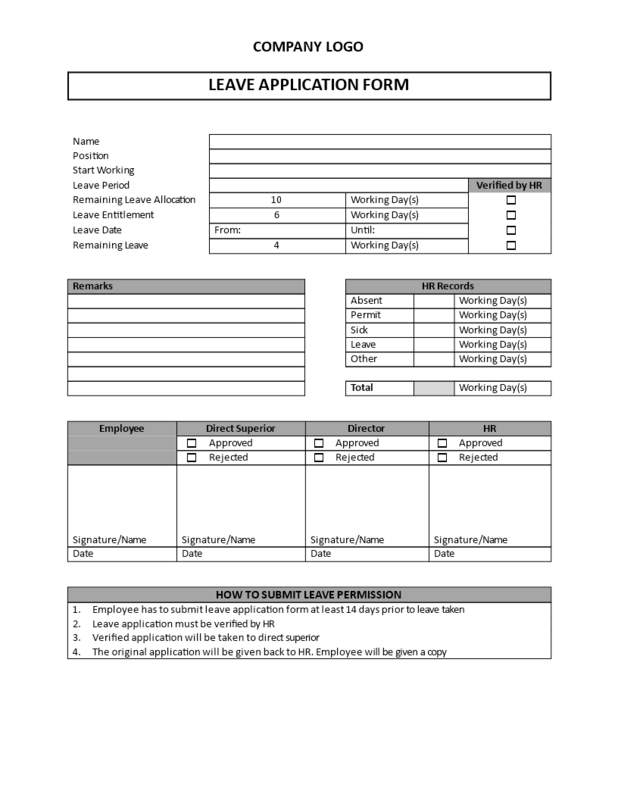 Download this Leave Application Form template now! This Leave Application Form is needed when employees apply for a leave of absence. In general, the manager or the HR department will send the form out to the concerned employee, and also signs off on it. By using our form, you will see that you will make it easier to implement leave approvals in your company. This Application for Leave template will, therefore, professionalize your the way of communication towards your employees. This form is used by many HR professionals worldwide. We provide a template that will professionalize your way of communication towards your employees or HR department. This Leave Application Form can be used by the company staff to apply for their leave in accordance with the companies policy. If you have more than one request, please complete a separate form for each leave application. How to submit the leave permission request? The original application will be given back to HR. The employee will be given a copy. After downloading, you can customize every detail and appearance of your personalized version of the Leave Application Form. Download, modify and print out your Leave Application Form file directly. Click here for more leave application form templates. Check out these Leave Application Forms to your School Principal or to your boss!